Summer is coming faster than usual and Quality Air Heating and Air Conditioning would like to give you the opportunity to buy now and save later on a 19 point Air Conditioning inspection. Buy an A/C Check now for $49.95 (will be $89.95 come summer) and schedule it at a later date. This offer is only valid for Air Conditioning inspections purchased between 3/12 and 4/12 and scheduled through August of 2012. As with just about any other type of mechanical system, air conditioning systems wear down over time. Their parts will only work at peak efficiency for so long before they need to be replaced or they will impact the performance of the entire system. However, regular annual maintenance inspections of your air conditioning system can catch these types of issues before they turn into big problems. Maintenance checks don’t need to be a disruption to your daily life and they don’t take a lot of time. They will, however, give you the peace of mind that comes from knowing your air conditioning will work when you need it. 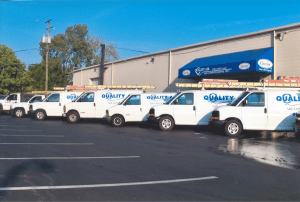 Quality Air Heating and Air Conditioning is founded on principles of honesty and integrity. We believe the success of our business is a result of treating our customers as we would treat our family and friends, with straightforward answers and cost effective solutions.